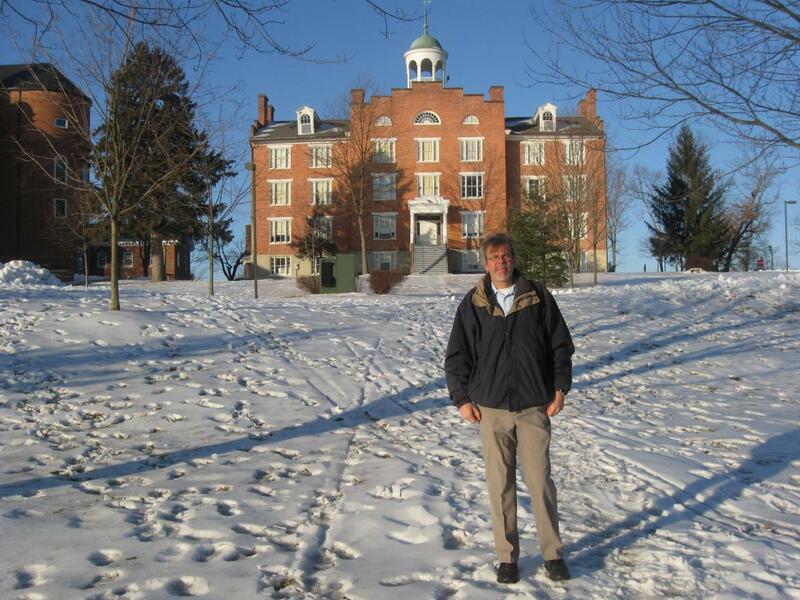 Licensed Battlefield Guide Tim Smith is also the Research Historian for the Adams County Historical Society located in Schmucker Hall on the campus of the Lutheran Theological Seminary. 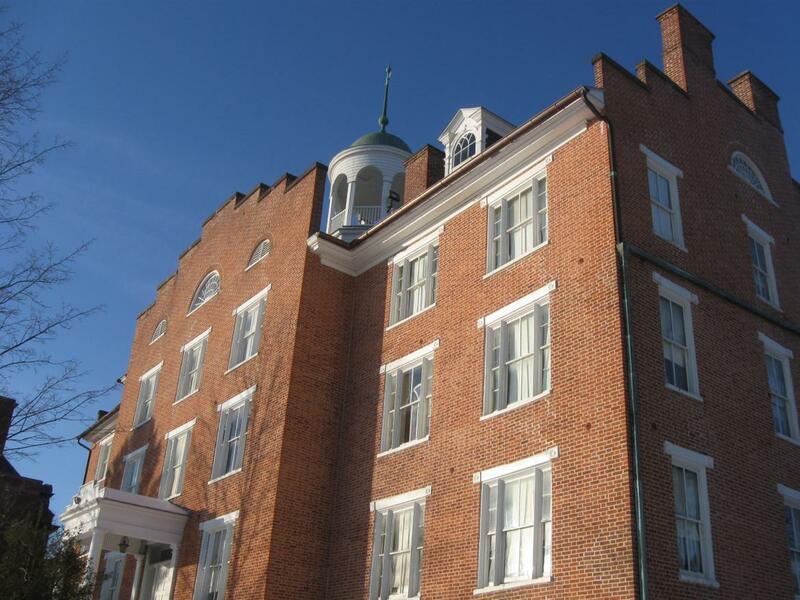 Today Tim tells us about stories about the cupola on top of the Seminary being used by Brigadier-General John Buford. 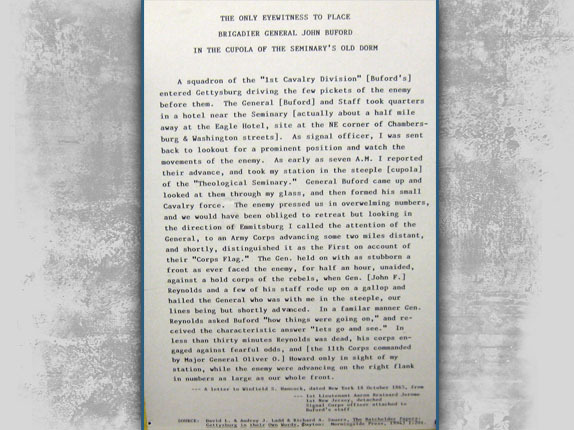 He also gives the evidence for the possible meeting between Buford and Major-General John Reynolds. 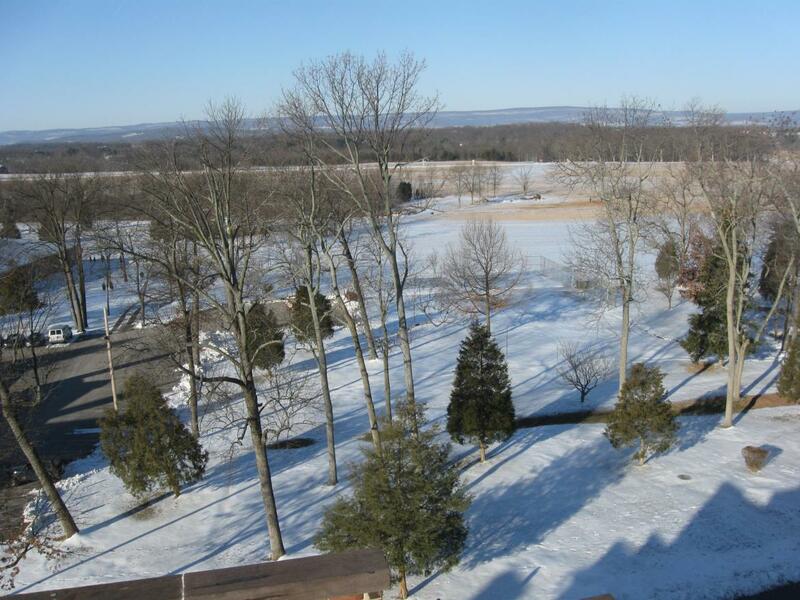 Notice the sled marks at what has been for over 100 years, one of Gettysburg’s most popular sledding areas. This view was taken facing northeast at approximately 9:45 AM on Sunday, February 1, 2009. 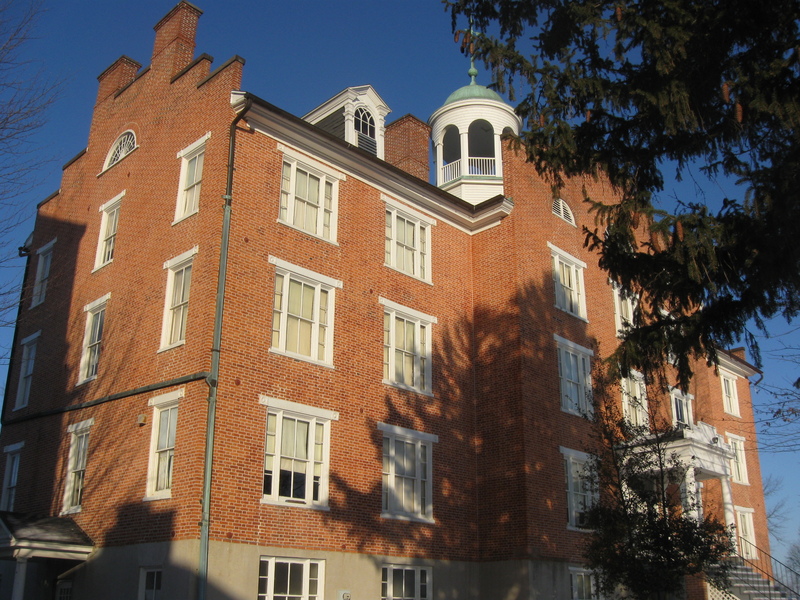 Over the years, there has been some question if United States Brigadier-General John Buford used the cupola at the Lutheran Theological Seminary as an observation post, and if he met Major-General John Reynolds on July 1, 1863 while Buford was in the cupola and Reynolds was yelling up at him from the yard of the Seminary. Licensed Battlefield Guide Tim Smith, also the Research Historian for the Adams County Historical Society, will present evidence concerning these stories. 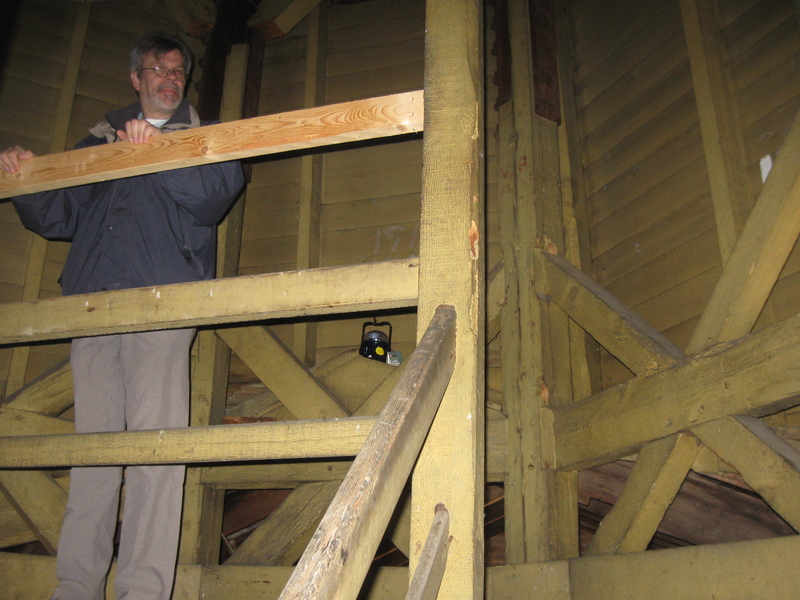 Tim also takes us up into the cupola and explains what Buford might have seen. On our next cupola post, we will show panoramas from the cupola, and Tim will give us a video tour from that location. ACHS Battle of Gettysburg Civil War Research Room: LBG Tim Smith February 10, 2009. Civil War Research Center Now Open in Schmucker Hall on June 20, 2008. Seminary Ridge Avenue Update on October 24, 2008. The Leveling of Seminary Ridge Avenue on October 3, 2008. Seminary Avenue Roadwork on September 16, 2008. 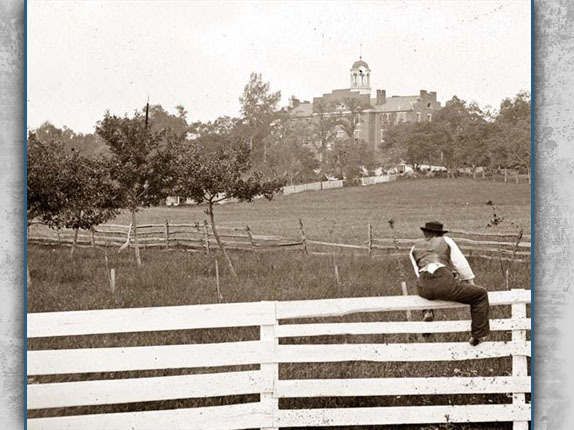 This view of the Lutheran Theological Seminary was taken by Mathew Brady’s personnel approximately two weeks after the battle. 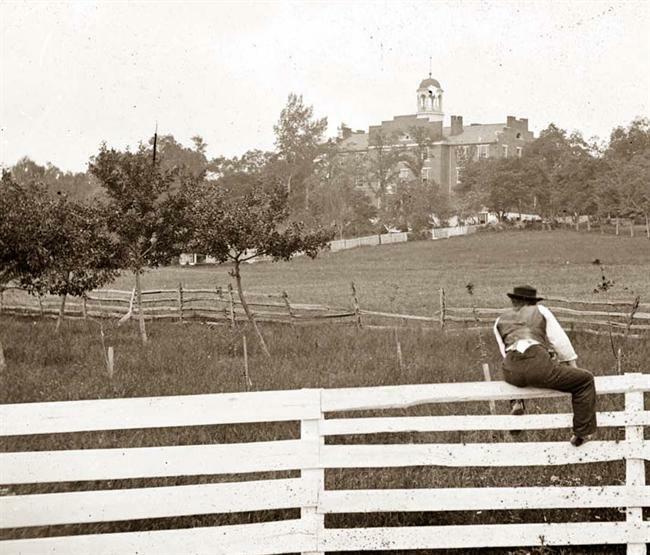 At the time the photograph was taken, the Seminary was being used as a hospital. The “tan bark path” that Tim Smith mentions in the first video is in the tree line on the other side of the white picket fence. What appears to be a hole in the cupola is a defect in the negative. This view was taken facing southwest circa July 15, 1863. In video #1, Tim Smith explains how Major-General John Reynolds rode up the tan bark path to the Seminary building. He also goes over the problem of Reynolds or anyone else having difficulty in seeing someone in the cupola when one gets too close to the building. This view was taken facing east to west at approximately 9:45 AM on Sunday, February 1, 2009. 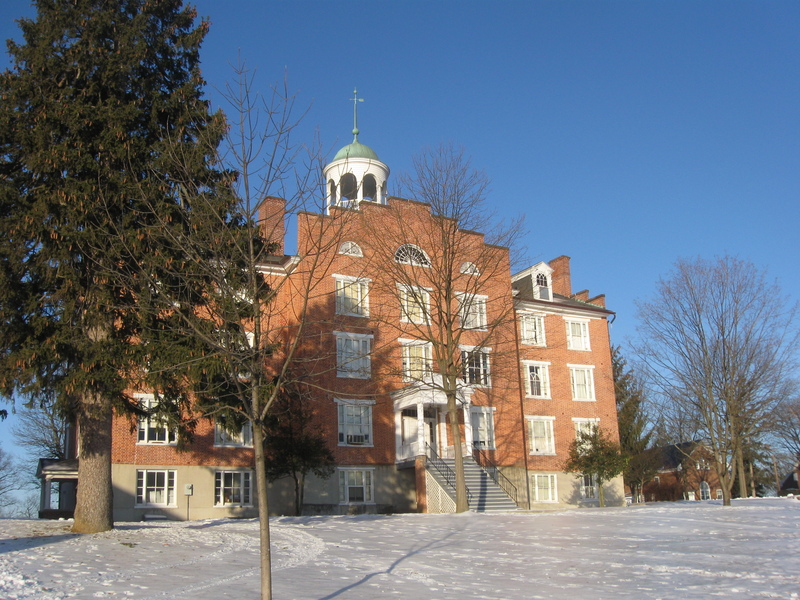 The Lutheran Theological Seminary purchased land on Oak Ridge, located on the west side of Gettysburg, for the location of its permanent home. 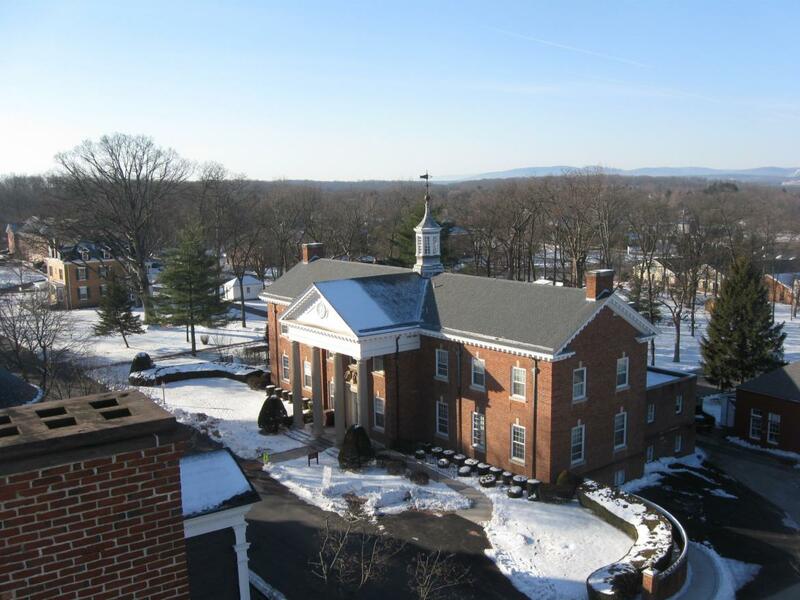 Construction of this new Seminary building began on May 26, 1831, and was finished in 1832 for a cost of approximately $7000. A building steward occupied the first floor. Professors held class in the rooms of the second floor. 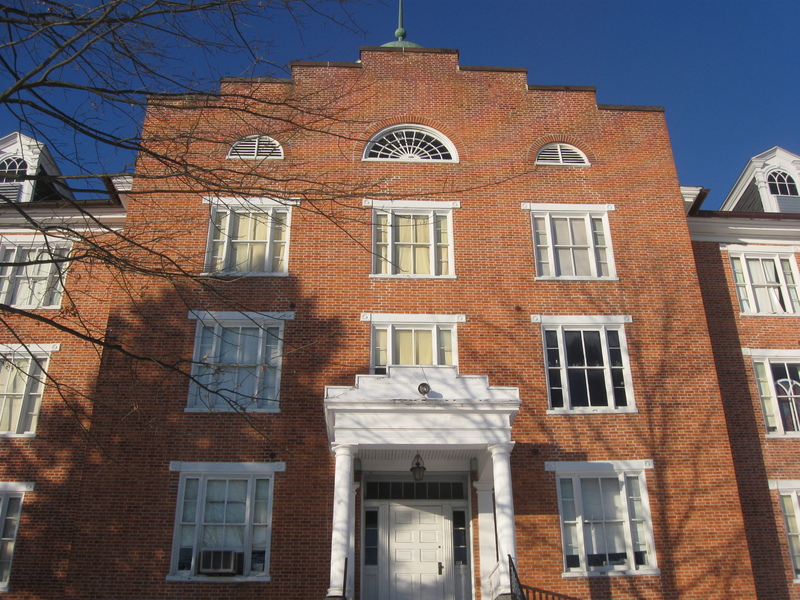 The third floor served as the student dorm. 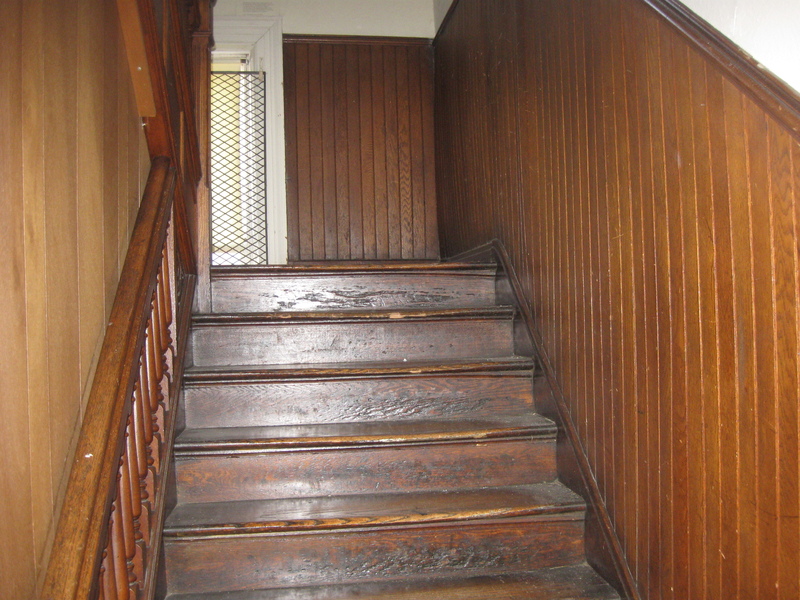 The fourth floor was not finished until student enrollment reached a point where it was deemed necessary in the late 1850s. This view was taken facing northwest at approximately 8:30 AM on Sunday, February 1, 2009. As Tim explained in video #1, when you get too close to the Seminary building, you cannot see the cupola or anyone who might have been standing in it. The main entrance to the Seminary was at the door in the bottom of this picture. Notice the fan shaped window at the top of the building. 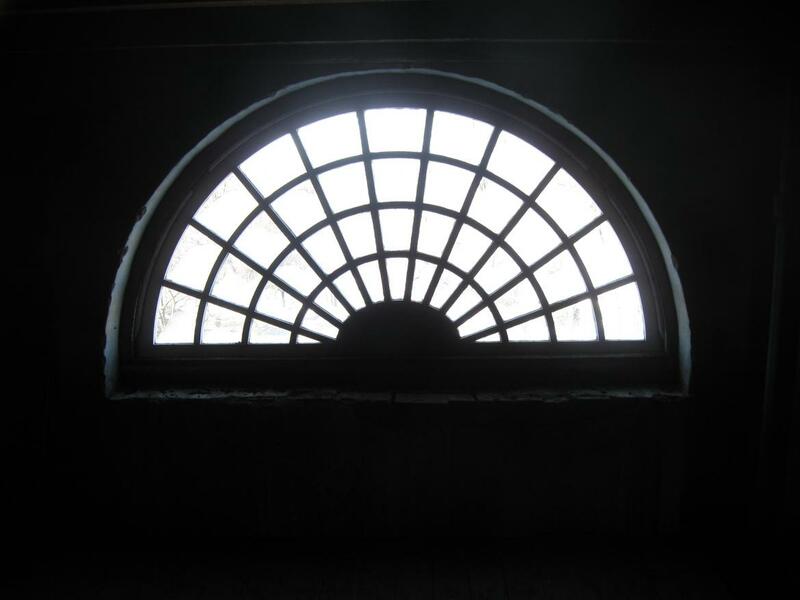 After a few more pictures we will show you this window and a matching window from the inside looking out. This view was taken facing west at approximately 8:30 AM on Sunday, February 1, 2009. You can get a closer view of the cupola by looking at it from the southeast side of the building… This view was taken facing northwest at approximately 8:30 AM on Sunday, February 1, 2009. …or the northeast side. However, we’re still probably not close enough to hear a conversation while a battle was going on. Unless there was a lull in the battle, someone would have to yell fairly loudly to be understood. This view was taken facing southwest at approximately 8:30 AM on Sunday, February 1, 2009. 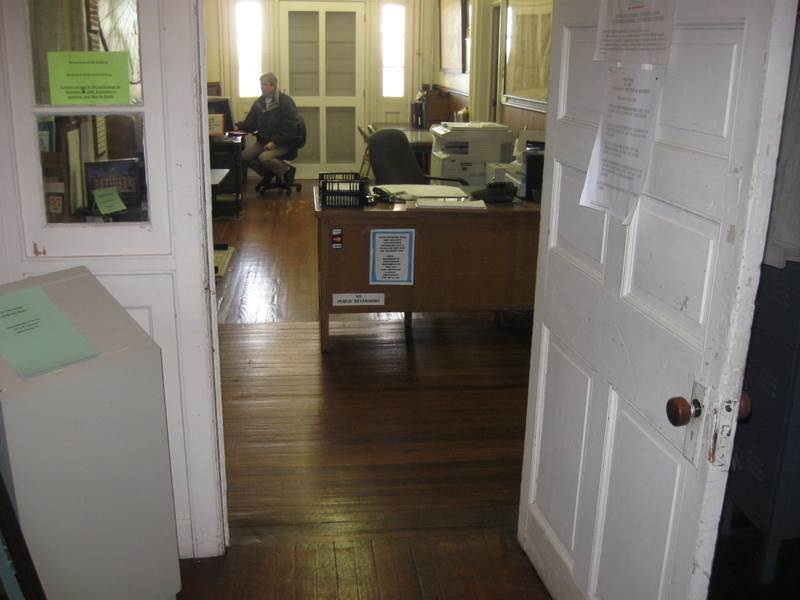 In the 1860s the main entrance to the Seminary building was the door on the other side of Tim. This view was taken facing east at approximately 9:00 AM on Sunday, February 1, 2009. 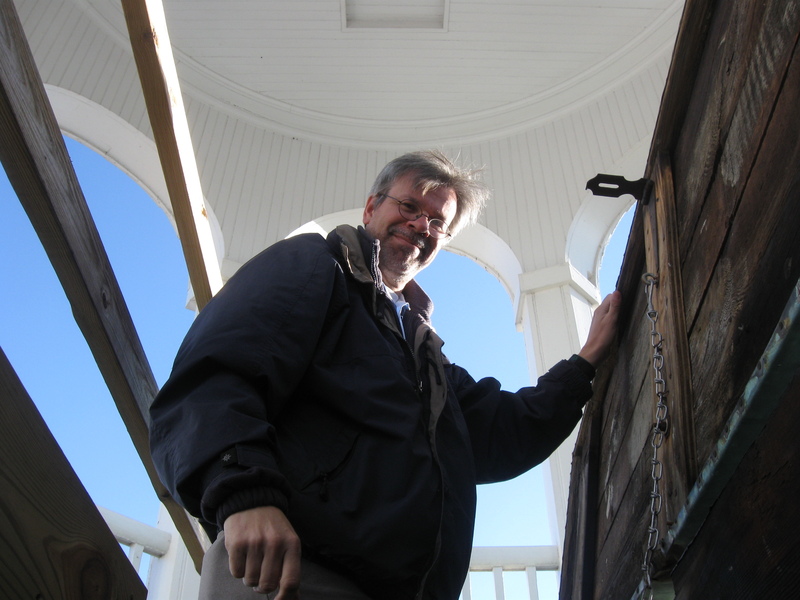 To get into the cupola, twice a year the Adams County Historical Society has fund raising events that allow visitors to stand in the same area where John Buford stood. The requested donation is $100 for members of the Adams County Historical Society, and $125 for non-members. Small groups start south down this hallway, and past the Battle of Gettysburg Civil War Research Room…This view was taken facing south at approximately 9:45 AM on Sunday, February 1, 2009. … then start their ascent up the south staircase on the other side of this door. This view was taken facing southwest at approximately 9:45 AM on Sunday, February 1, 2009. The staircase goes up four floors. This view was taken facing north at approximately 9:45 AM on Sunday, February 1, 2009. 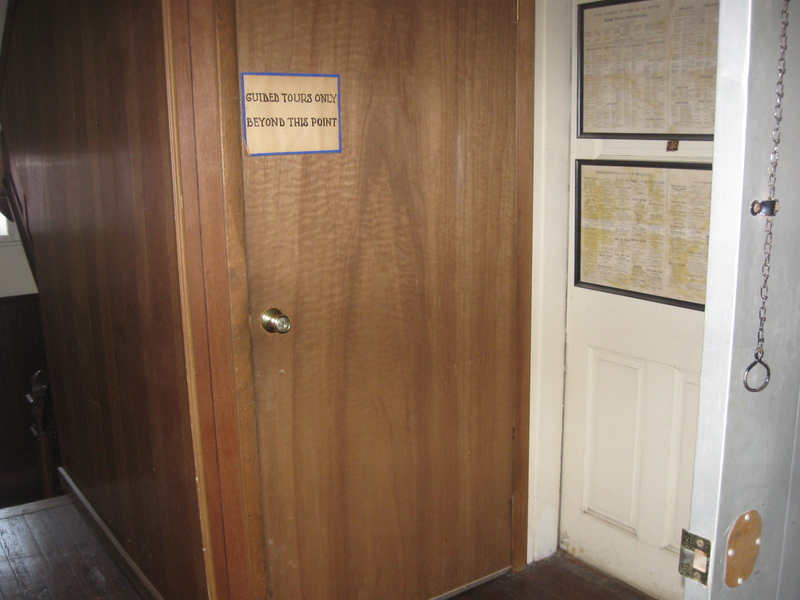 The other floors also have exhibits, of which you should request a tour. This view was taken facing north at approximately 9:45 AM on Sunday, February 1, 2009. 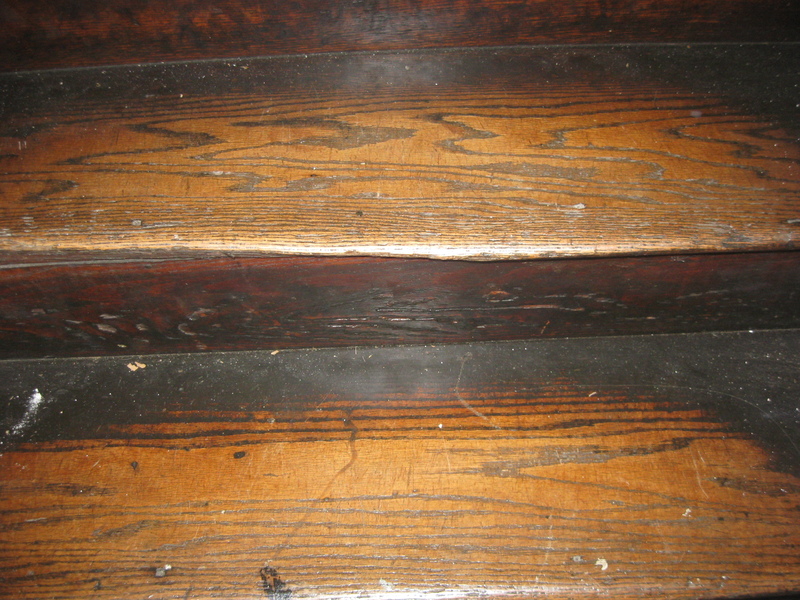 In places the steps are very worn… This view was taken facing north at approximately 9:45 AM on Sunday, February 1, 2009. …very, very worn. This view was taken facing north at approximately 9:45 AM on Sunday, February 1, 2009. We have finally reached the top floor, or attic. This view was taken facing north at approximately 9:45 AM on Sunday, February 1, 2009. 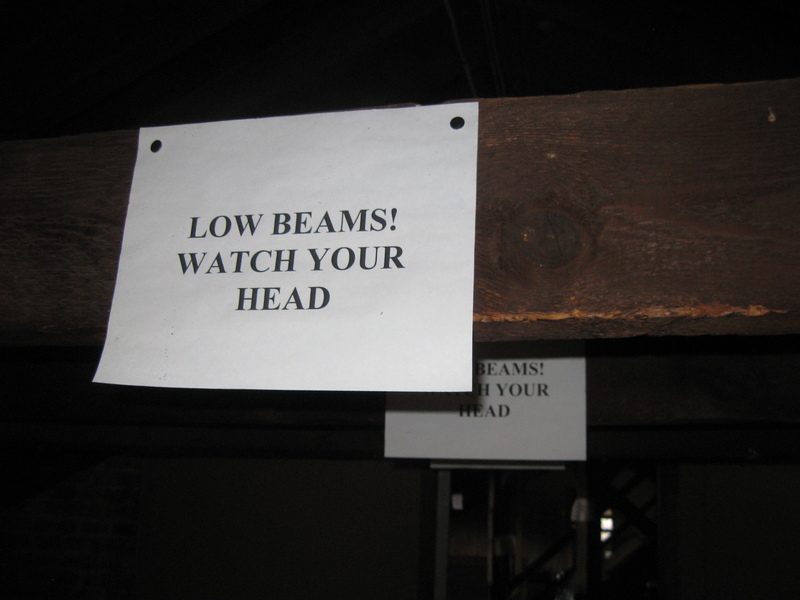 These warning signs were probably not here in 1863. This view was taken facing north at approximately 9:45 AM on Sunday, February 1, 2009. 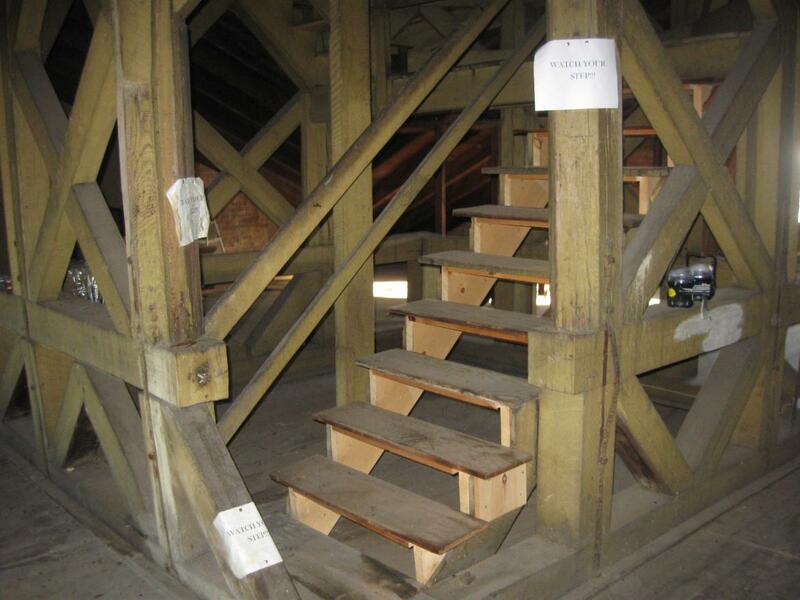 In the center of the attic is this staircase leading up to the cupola. This view was taken facing northeast at approximately 9:45 AM on Sunday, February 1, 2009. 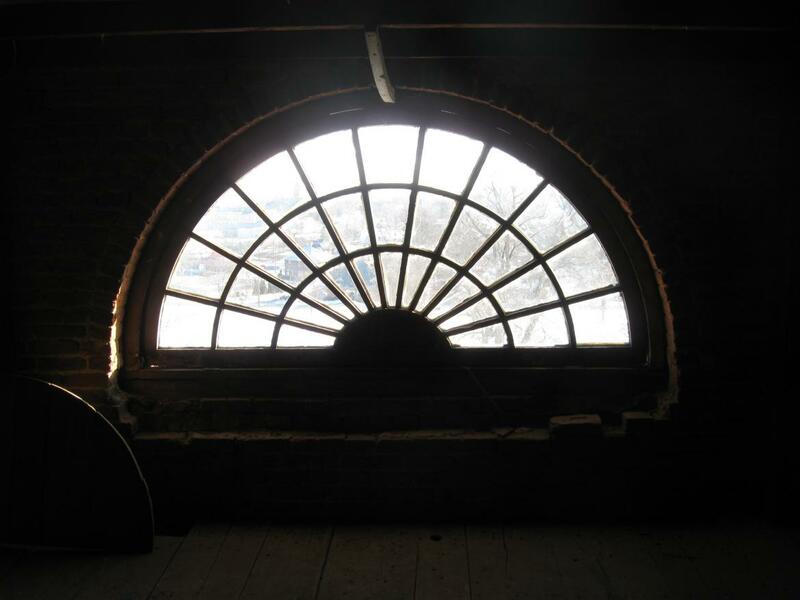 Here is the fan shaped window on the east wall that we saw from the outside. This view was taken facing east at approximately 9:45 AM on Sunday, February 1, 2009. Here’s the west window. We know you probably can’t tell the difference, so you’ll just have to trust us. This view was taken facing west at approximately 9:45 AM on Sunday, February 1, 2009. Tim is standing at the bottom of the staircase. We’re still approximately 20 feet below the cupola. This view was taken facing east at approximately 9:45 AM on Sunday, February 1, 2009. 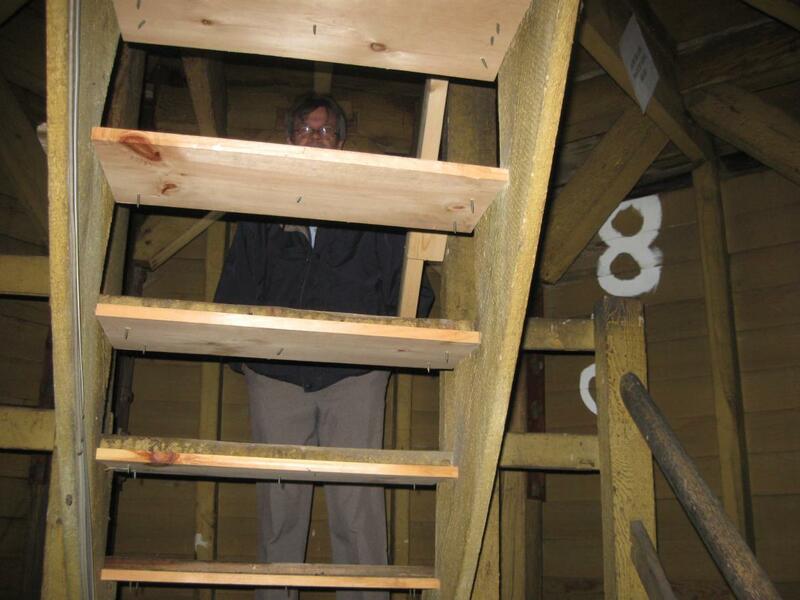 In Video #2, Licensed Battlefield Guide Tim Smith explains that at the time of the battle a ladder led from the attic to the cupola. 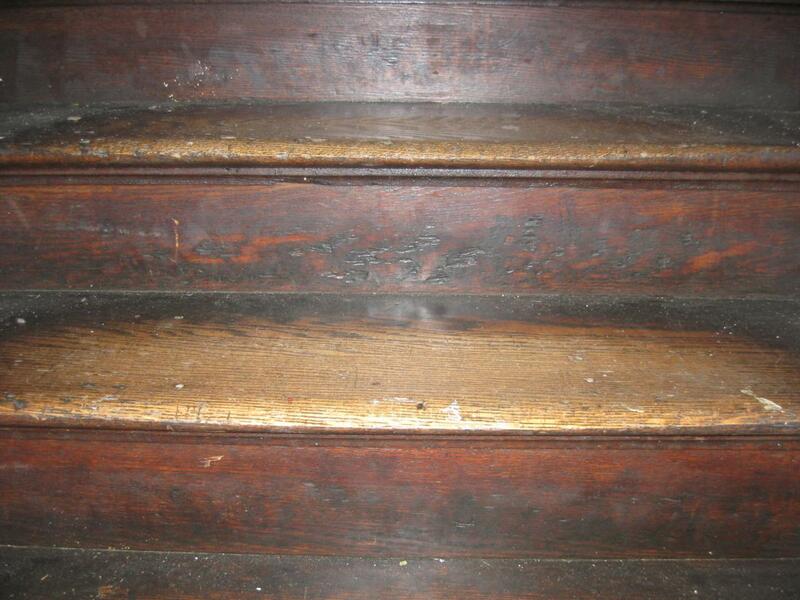 This staircase was built after the original cupola burned. The original cupola was struck by lightning in 1913. This view was taken facing east at approximately 9:45 AM on Sunday, February 1, 2009. Tim is ahead of us as we go up the staircase, and is already on the first landing. This view was taken facing northeast at approximately 9:45 AM on Sunday, February 1, 2008. Tim is now on the second landing patiently waiting for us to follow. This view was taken facing west at approximately 9:45 AM on Sunday, February 1, 2009. 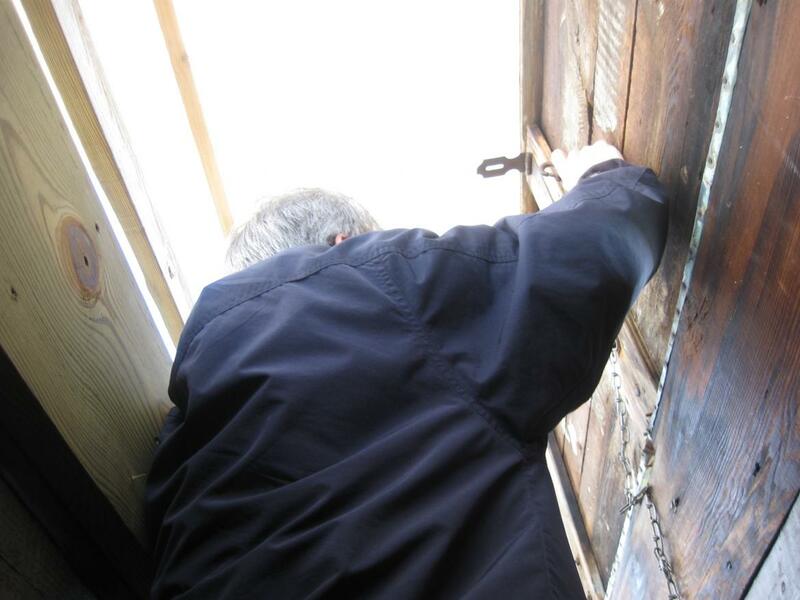 We’ve finally reached the door to the cupola. This view was taken facing east at approximately 9:45 AM on Sunday, February 1, 2009. Of course we are very trusting that Tim won’t drop this heavy door on us. This view was taken facing east at approximately 9:45 AM on Sunday, February 1, 2009. 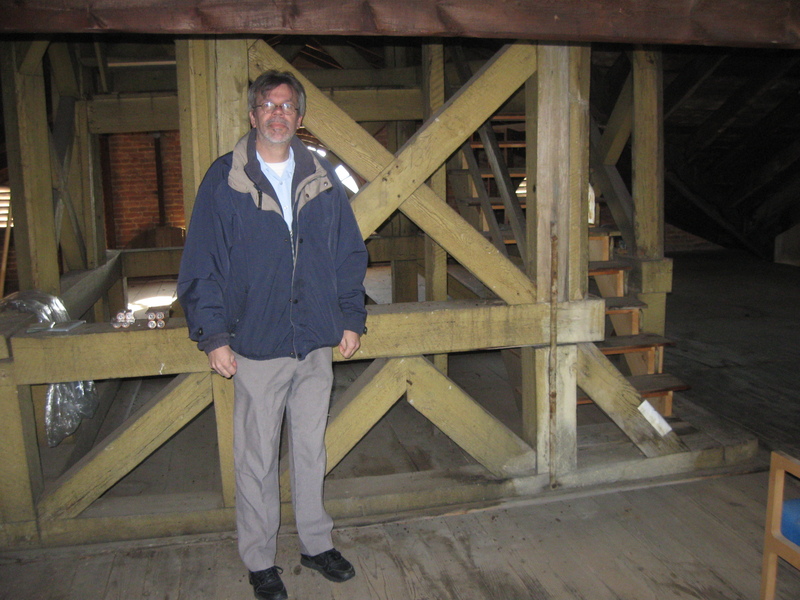 We’re standing in the cupola, and Tim is standing by the northwest railing. This view was taken facing west at approximately 9:45 AM on Sunday, February 1, 2009. In video #3, Tim explains how the Gettysburg movie filmed the cupola scene, and explains that he believes the meeting between Reynolds and Buford did happen similar as to how it was shown in the movie. At the end of the video, Tim states we will do a panorama of the area. We will show that panorama in a later post. This view was taken facing west at approximately 9:45 AM on Sunday, February 1, 2009. 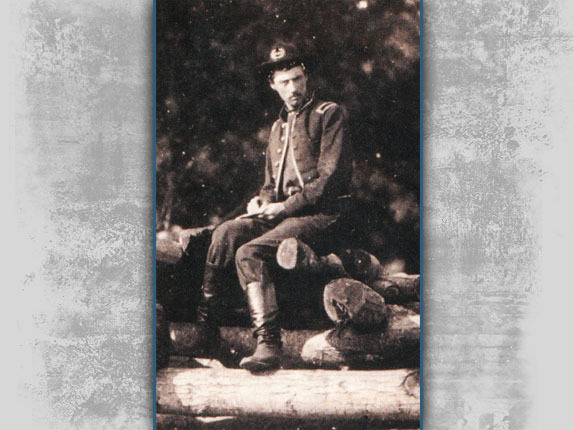 This is a detail from a photograph of Lieutenant Aaron B. Jerome at the Elk Ridge signal station during the Antietam campaign. 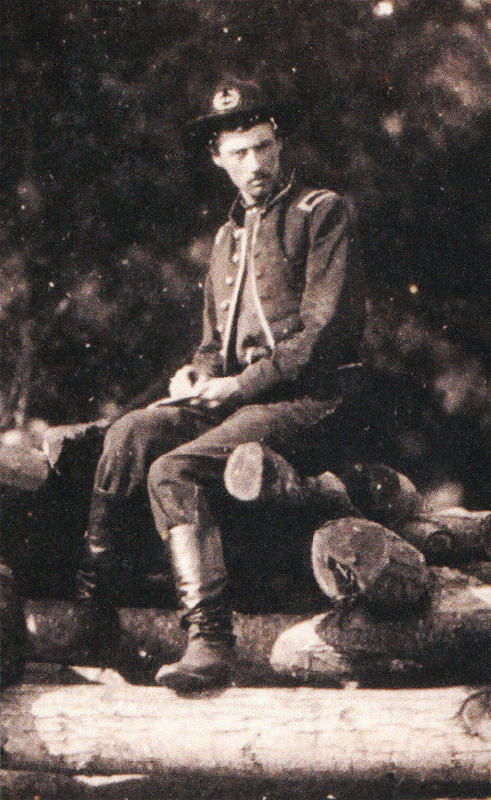 At the Battle of Gettysburg, Jerome was the Signal Officer for Buford’s Cavalry Division. This view was taken facing east at Elk Ridge, Maryland at approximately September or October, 1862. 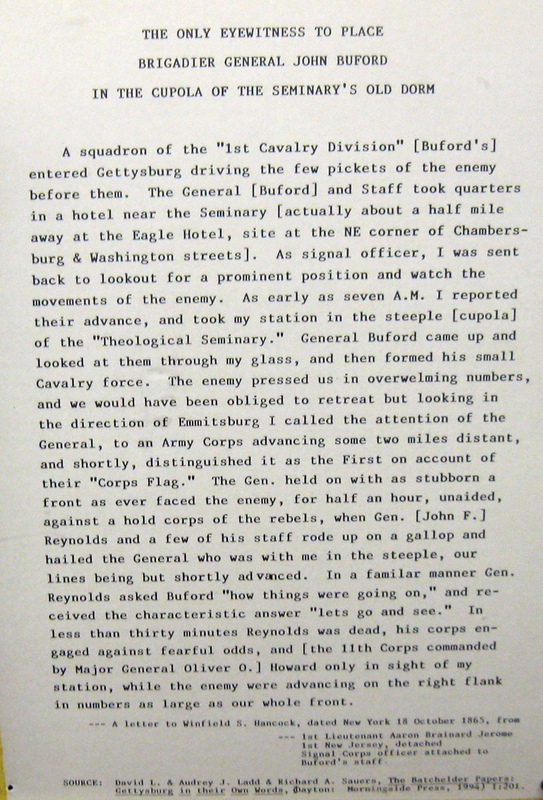 Here is a typescript from a letter that Lieutenant Jerome wrote General Winfield Scott Hancock about meeting Buford in the cupola. This letter was written on October 18, 1865. We’re going to show the panorama in our next post, but to give you an idea of the view, here’s a picture facing generally northwest. The Wentz Library is in the foreground. 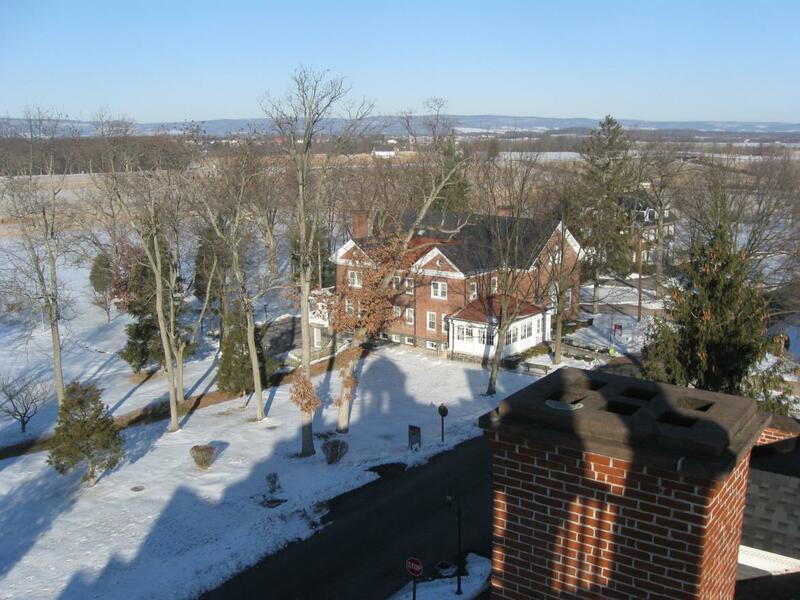 Above its cupola is a hill, College Hill, which overlooks Emmitsburg, Maryland. There was a United States Signal Station there during the battle, and Tim will talk about it in the next video. This view was taken facing northwest at approximately 9:45 AM on Sunday, February 1, 2009. This view is generally looking west. The solid woodline across the fields to the front right are McPherson’s/Reynolds’/Herbst’s Woods. This view was taken facing west at approximately 9:45 AM on Sunday, February 1, 2009. View generally facing northwest. Above the brick building in the foreground is the white McPherson Barn. To the left of the McPherson Barn are McPherson’s/Reynolds’/Herbst’s Woods. The barn at the Herr Tavern is the small orange speck just to the left of the tallest tree in the foreground. This view was taken facing northwest at approximately 9:45 AM on Sunday, February 1, 2009. In Video #4, Tim is discussing the possibility of whom Aaron B. Jerome could have been signaling to before the rest of the Army of the Potomac could come up and establish signal stations. Was he signaling College Hill near Emmitsburg, Maryland, approximately 10 miles away? Or was Jerome simply serving as a looking for Buford’s troopers to give them information on enemy movements? This view was taken facing southwest at approximately 8:45 AM on Sunday, February 8, 2009. 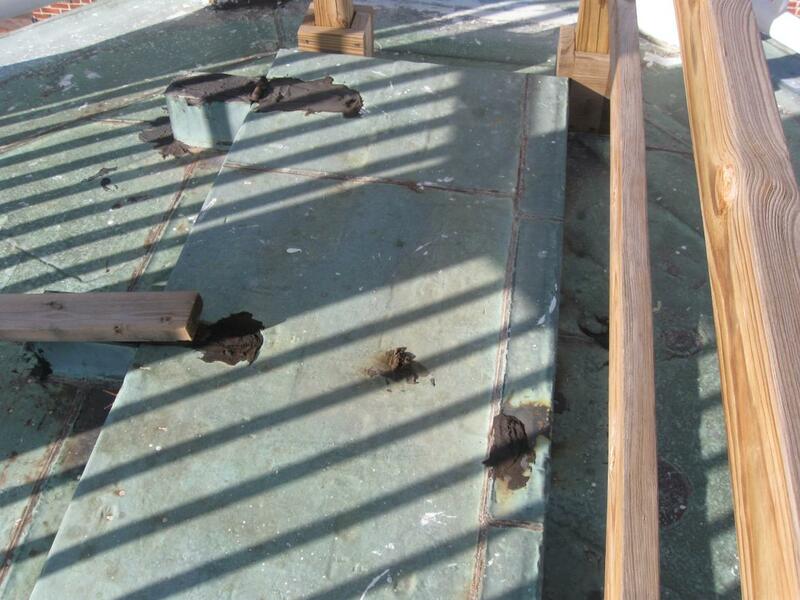 This is the door which is on the floor of the cupola. 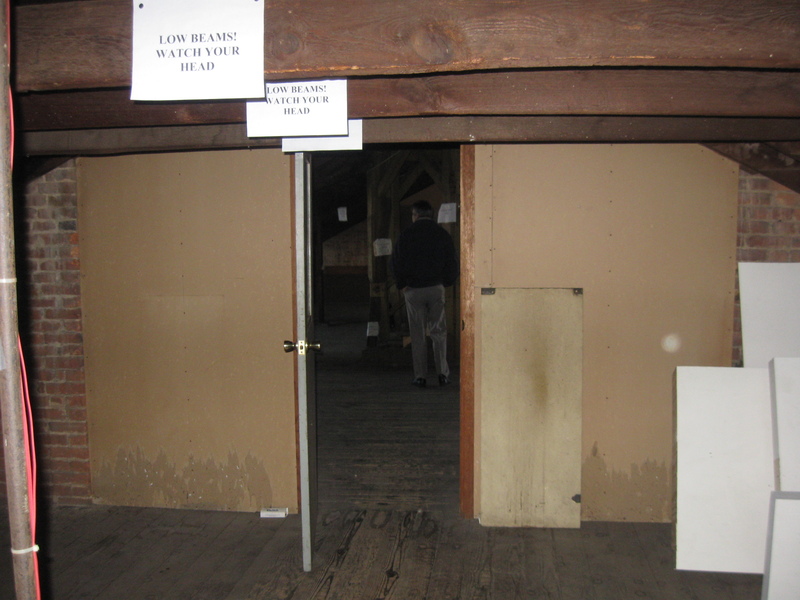 It is very reassuring to those of us who are not comfortable with heights to hear Tim Smith mutter after the door is closed: “I hope I didn’t lock that by mistake.” This view was taken facing west at approximately 9:45 AM on Sunday, February 1, 2009. In video #5 Tim points out the difference between how Sam Elliott exited the cupola in the Gettysburg movie, going down the stairs from west to east, instead of the actual staircase, which goes from east to west. Of course Buford would have had to go down a ladder. This trip made us wonder when they hear those who say that General Robert E. Lee was in the cupola, if Lee was really going to climb a 20 foot ladder for the view here. This view was taken facing south to west at approximately 9:45 AM on Sunday, February 1, 2009. Gettysburg Guide Room: The Final Days on March 8, 2008. Lights Out at the Electric Map on April 13, 2008. New Guide Room at the New Visitor Center on April 19, 2008. 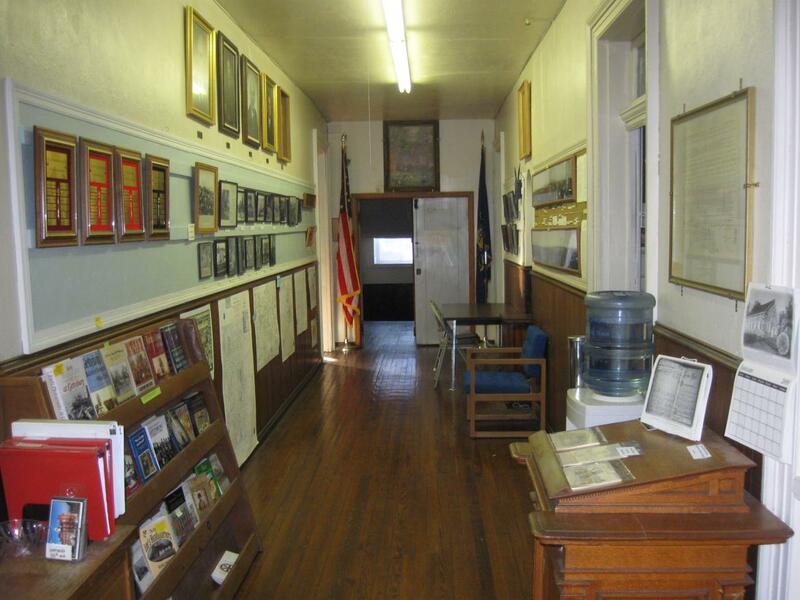 New Association of Licensed Battlefield Guide Office and Library Opens on August 25, 2008. Evergreen Cemetery Headstone Damage with LBG Deb Novotny on October 20, 2008. Camp Letterman Part 1 with LBG Phil Lechak on November 15, 2008. Camp Letterman Part 2 with LBG Phil Lechak on November 17, 2008. Camp Letterman Part 3 with Licensed Battlefield Guide Phil Lechak on February 4, 2009. Camp Letterman Part 4 with Licensed Battlefield Guide Phil Lechak on February 9, 2009. Camp Letterman Part 5 with Licensed Battlefield Guide Phil Lechak on February 11, 2009. Gettysburg Artillery Part 1 with LBG George Newton on November 21, 2008. “Mammy’s Little Baby Loves Guided Tours” with LBG Charlie Fennell on November 23, 2008. Bucktails on McPherson’s Ridge Part 1 with LBG Rich Kohr on November 26, 2008. Gettysburg Licensed Battlefield Guide Exam 2008 on December 6, 2008. Gettysburg Hawk Hunting with Licensed Battlefield Guide Dave Weaver on December 14, 2008. Licensed Battlefield Guide Rich Bellamy: Colonel Edward Ephraim Cross Part 1 on January 3, 2009. Licensed Battlefield Guide Rich Kohr: William Wible’s Gettysburg Quarry on January 21, 2009. Licensed Battlefield Guide Rich Kohr: The Gettysburg Electric Trolley Part 1 on January 23, 2009. Licensed Battlefield Guide Rich Kohr: The Gettysburg Electric Trolley Part 2 on January 26, 2009. 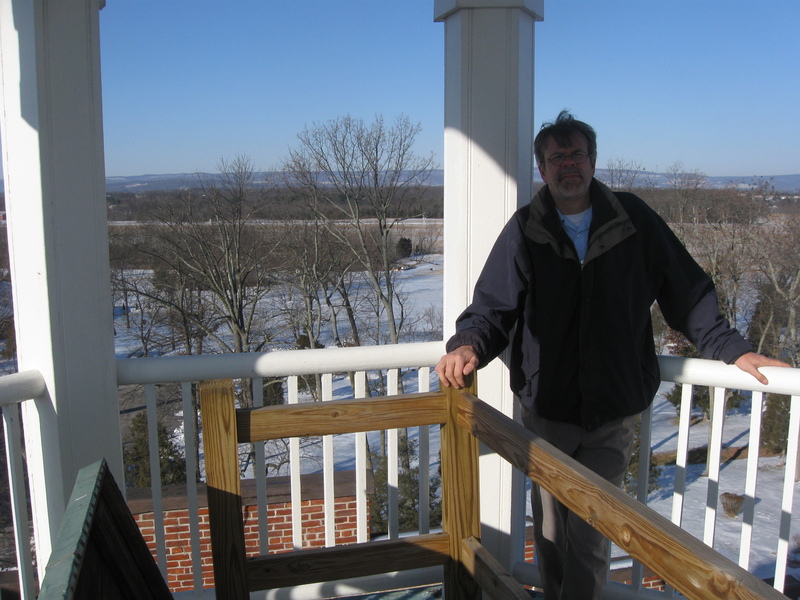 Licensed Battlefield Guide Rich Kohr: The Gettysburg Electric Trolley Part 3 on January 29, 2009. Licensed Battlefield Guide Rich Kohr: The Gettysburg Electric Trolley Part 4 on February 2, 2009. Licensed Battlefield Guide Rich Kohr: The Gettysburg Electric Trolley Part 5 on February 6, 2009. 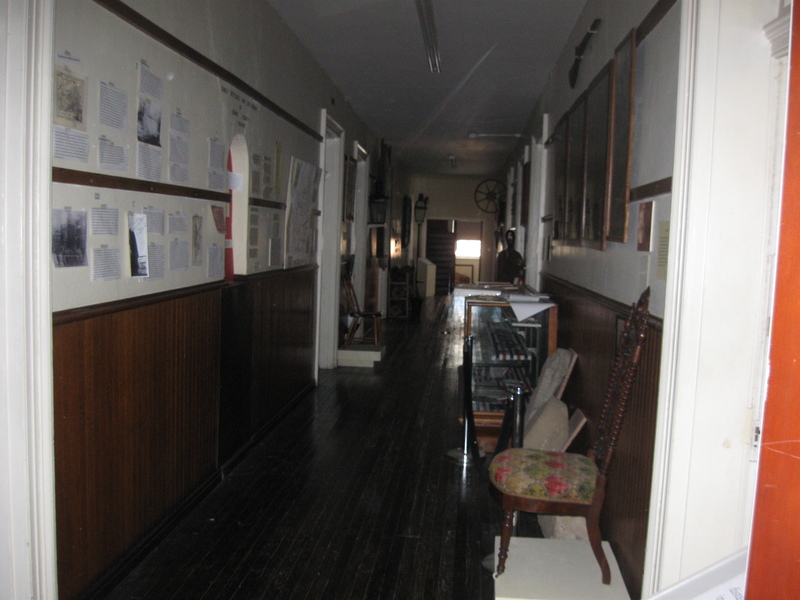 ACHS Battle of Gettysburg Civil War Research Room with LBG Tim Smith on February 10, 2009.